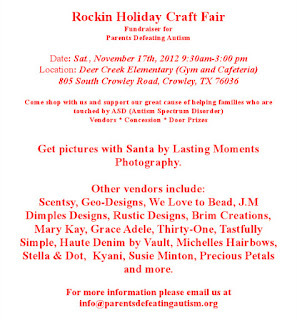 "Parents Defeating Autism is hosting Rockin Holiday Craft Fair to raise awareness and funds to help bring resources to Crowley and surrounding areas. Money is used to help families offset the cost of therapies and other needs not covered by medical insurance and to hold events for children who have Autism and their families.Come and pamper yourself or buy that hard-to-shop-for family member the perfect gift. There will be door prizes from vendors and area businesses." Late registration is $50 and accepted until November 12th. Early registrants will be on additional fliers and info sheets. Electricity is available but spaces are limited and you must request it on your application. Applications are available here and are due by November 12th, 2012.